Mrs. Prince and Co.: Essential Oils---What are they? Before I go into more detail about my essential oil experience and story, let's talk about what essential oils are. Just in case you're not sure or would like some basic info. >>>>>> WHAT ARE ESSENTIAL OILS??? They are usually extracted through distillation but sometimes through cold-pressing. They make up a plant's "immune system" protecting it from bad stuff like fungi and bacteria. >>>>>> HOW DO YOU USE ESSENTIAL OILS??? Inhale- inhale directing from the bottle, diffuse with a diffuser, or a drop in the palm of your hand, cover your face and breathe deeply. Topically- apply directly on the skin or with a carrier oil. Bottom of the feet, along the spine, edge of ear, inside mouth, on wrists or an immediate area of concern are good places to apply oils. >>>>>> WHY SHOULD I USE ESSENTIAL OILS??? Want a healthy and natural way to improve your health?!? There are so many different essential oils which means there are numerous ways and reasons to use them. Essential oils may help improve sleeping patterns, improve your immune system, may improve seasonal discomforts and so much more. We'll go into more depth on what each oil from the starter kit may help with over the next few weeks! There are many different essential oils on the market today but please know the quality of the oil is EVERYTHING. Young Living Essential Oils are PURE, THERAPEUTIC grade essential oils. So pure, they can be ingested and so different from PERFUME grade essential oils and even oils purchased at health food stores which often contain fillers and are not 100% pure oil. Essential oils are currently not regulated by the FDA so companies can put whatever they want on the bottle. The reactions you may have seen or read about are due to not using the highest quality of essential oils and/or not using them properly. Check out Young Living's amazing Seed to Seal guarantee to learn about how their oils are cultivated - from the planted seed to the sealed bottle. >>>>>> WANT TO KNOW MORE??? >>>>> IF YOU WANT TO DIVE IN! 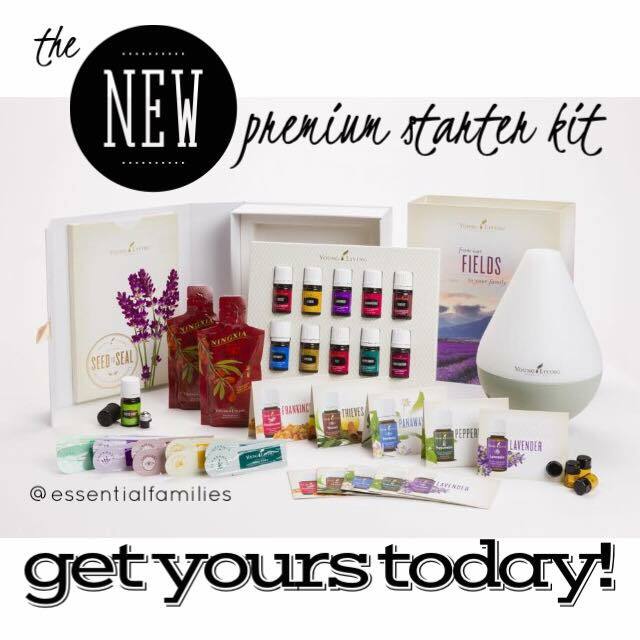 At this point, you can order more products if you would like to or you can check out with your starter kit. You did it! Welcome to the Essential Families team! My words are not intended to diagnose, treat or cure any disease or health ailment. Please do your research and make informed decisions when it comes to you and your family’s health. I am not a doctor and am only sharing what has worked for me and my family. Results may differ for each person. Thank you!